$14.437 million on 3470 screens. When I heard that the Broadway hit Rock of Ages would come to movie screens, I figured it'd be a big success. Why? It reminded me a ton of 2008’s Mamma Mia, another stage production that moved to the cinema. Both offered peppy, frothy shows with lots of popular old songs, and both boasted star-studded casts. So why did Mamma Mia earn $143 million while Ages flatlined with an anemic $38 million? Your guess is as good as mine. 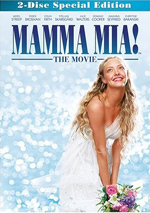 Incompetently made and generally awful, I still have no clue why Mamma Mia struck such a chord with audiences. Is Ages any better? Yeah, but not as much as I’d like. While it fails to plummet to Mamma Mia levels of crumminess, it doesn’t do much right. Set in 1987, pretty young Sherrie Christian (Julianne Hough) leaves home to move to LA and pursue her dream to make it big as a singer. She comes to the Sunset Strip and immediately gets robbed. A bartender at a hot rock club named Drew Boley (Diego Boneta) sees this and attempts to help her via a job at the Bourbon Room. After some pestering, owner Dennis Dupree (Alec Baldwin) agrees and gives her the gig. There she learns the ropes, attempts to further her singing career – and develops a romance with Drew. In the meantime, politician’s wife Patricia Whitmore (Catherine Zeta-Jones) swears that she and her moralistic parents’ group will clean up the Sunset Strip and rid it of that evil, pernicious rock music. This leads to a showdown when megaband Arsenal – led by singer Stacee Jaxx (Tom Cruise), on the verge of a solo career – comes to the Bourbon for an important show. Earlier I asked if Ages bettered Mamma Mia, and the answer is yes; it’s definitely the stronger film of the two. However, that doesn’t take much doing; Mamma was an incompetent embarrassment. At the very least, Ages looks like the product of professionals who understand how to create movies. However, none of this makes Ages a good movie. While not as much of a mess as Mamma Mia, it lacks coherence and tends to ramble – and it suffers when compared with the music of the earlier film. I’m not a huge ABBA fan, but they created some fine pop. Ages comes packed with the worst dreck of the Eighties, cheesy hard rock that I hated 25-plus years ago and that still leaves me unimpressed. By my count, there’s one good song here: Guns n’ Roses’ “Paradise City”. Otherwise, it’s one stinker after another – and we get a lot of them, as the movie jams in tons of tunes. Part of the problem is that Ages comes across as absolutely desperate to convince us that it’s fun. Mamma Mia had the same problem: both films come crammed to the gills with forced perkiness and hyperactivity. Ages seems way too eager to please, as it virtually begs, pleads and cajoles us to feel entertained. It doesn’t work. The jokes – most of which come from the Alec Baldwin and Russell Brand roles – fall flat, and the production numbers come across as overblown and forced. We find such clunky exposition that the script almost feels like a parody, as if the writers decided to make fun of bad narrative development. No one in the cast manages to do much to elevate the flick. Playing an obvious riff on Axl Rose, Cruise occasionally threatens to add some life to matters, but the movie overuses him; Jaxx would work better as a small part, not a fairly major one. Our leads have little chemistry and barely stick to the film. They’re both attractive but totally lightweight, and they lack enough charisma to carry their parts. We never vaguely buy either of them as potential stars, and given the movie’s story, that’s a problem. All of this leaves us with a pretty forgettable musical experience. I’ve seen worse than Rock of Ages, but that’s not much of an endorsement. The movie just tends to run in place and not go anywhere interesting. 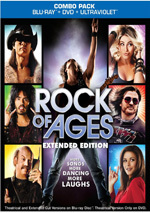 Rock of Ages appears in an aspect ratio of approximately 2.40:1 on this Blu-Ray Disc. The movie delivered a consistently excellent presentation. At all times, sharpness looked great. Even in the widest shots, no signs of softness materialized, as the film remained distinctive and crisp. The image lacked shimmering or jagged edges, and I discerned no signs of edge haloes. As one would expect of a brand-new flick, print flaws failed to mar the transfer. With its 80s setting, Ages went for a colorful pallette. Heavy reds tended to dominate, and all the hues tended toward a nearly oversaturated look. These choices worked well, as the tones seemed vivid and dynamic. Blacks were dark and tight, while low-light shots displayed strong accuracy and delineation. I found no reason to complain about this terrific transfer. As expected, music dominated the film’s DTS-HD MA 5.1 soundtrack. The score and various songs opened up the room and used the five speakers in a satisfying manner. These used the channels in a vivid, engulfing way, and effects broadened matters well. Those didn’t often get a ton to do – this was a musical, after all – but they added some impact to the movie. Audio quality was always solid. Of course, music was the biggest factor; songs and score sounded lively and dynamic. Speech seemed distinctive and natural, without edginess or other issues, and effects seemed accurate and full. Bass response was warm and deep. The soundtrack suited the movie. A few extras fill out the disc, and these include both the film’s theatrical version (2:03:22) and an Extended Cut (2:16:14). How do these differ? I have no idea – I only watched the longer edition, so I couldn’t compare the two. Nonetheless, I wanted to mention that both pop up here. Legends of the Sunset Strip goes for 29 minutes, 56 seconds and includes notes from Rainbow Room/Whiskey A-Go-Go owner Michael Maglieri, actors Julianne Hough, Malin Akerman, Mary J. Blige, Diego Boneta, and Russell Brand, director Adam Shankman, executive music supervisor and composer Adam Anders, producers Garrett Grant and Matt Weaver, and musicians Sebastian Bach, Kevin Cronin, Bret Michaels, Pat Benatar, Neil Giraldo, Jay Jay French, Frankie Banali, Dee Snider, Joel Hoekstra, Joe Elliott, Rick Savage, Mickey Finn, Kip Winger, David Coverdale, Rikki Rockett, Jeff Pilson, Kelly Hansen, Jeff Duncan, Neal Schon, Nadir O’Priest, Erik Turner, Jerry Dixon, Danny Dangerous, Danny Nordahl, Jan Kuehnemund, Chris Holmes, Kelly Keagy, Jack Blades, Nuno Bettencourt, Vivian Campbell, Tommy Shaw, Rick Allen and Phil Collen. “Legends” looks at the 80s hard rock scene as well as some aspects of the movie’s use of the music. Most of the program gives us fond memories of the Good Old Days from the rockers, and those stories can be enjoyable. Of course, we find some rose-colored glasses at work here, but we still get some fun tales. It’s especially amusing to hear the rockers gripe about Autotune and other tools used for modern music since Rock of Ages uses so many of those methods to make its actors sing. During the 12-minute, 53-second The Stories We Sing, we locate comments from Michaels, Hoekstra, Blades, Keagy, Rockett, Cronin, Schon, Collen, Elliott, Allen, Savage, and Shankman. We learn about how the participants wrote “Sister Christian”, “Nothin’ But a Good Time”, “I Can’t Fight This Feeling”, “Don’t Stop Believin’” and “Pour Some Sugar On Me”. They deliver interesting anecdotes about the tunes. Eight clips appear under Defining a Decade. After a 25-second intro from actors Julianne Hough and Diego Boneta, we find “The ‘80s Look” (3:57), “It’s All About the Moves” (7:35), “Stripping Miami” (4:38), “The Tease” (4:13), “If You Build It, They Will Rock It” (3:02), “Connection to the Music” (4:32) and “It Started in a Bar” (7:12). Across these, we hear from Shankman, Bach, Akerman, Hough, Blige, Schon, Boneta, Grant, Brand, Hoekstra, Turner, Dixon, French, Winger, Cronin, Coverdale, Pilson, Hansen, Anders, Snyder, costume designer Rita Ryack, producer Jennifer Gibgot, production designer Jon Hutman, choreographer Mia Michaels, musician Debbie Gibson, stage musical producers Janet Billig Rich and Matt and Hillary Weaver, stage musical director Kristin Hanggi, stage musical arranger David Gibbs, stage musical actor Constantine Maroulis, theater critic Charles Isherwood, and actors Bryan Cranston, Eli Roth, Paul Giamatti, Catherine Zeta-Jones, Alec Baldwin, and Will Forte. The programs cover costumes, hair and fashion, choreography, sets and production design, music and performances, and elements of the original stage production. Through these featurettes, we get a consistently fluffy, peppy tone. That’s expected and acceptable, though, as the happy talk doesn’t become too over the top. Along the way, we find enough useful production details to make the clips worthwhile. Finally, the disc delivers a Music Video for “Any Way You Want It”. This uses the movie’s performance from Mary J. Blige and Julianne Hough and pairs it with a mix of film clips. It’s a glorified trailer. A second platter provides a DVD copy of Ages. 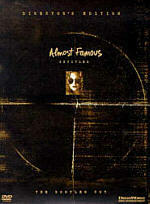 It offers a retail affair with a smattering of extras – including “Def Leppard: Live at the Premiere “, an 11-minute, 33-second reel in which the band plays “Rock of Ages” and “Pour Some Sugar On Me”. It seems odd this doesn’t appear on the Blu-ray. While it may not be the worst pop-rock musical I’ve seen, I can’t find much to endorse about Rock of Ages. It tries desperately to entertain but falls short of its goals. 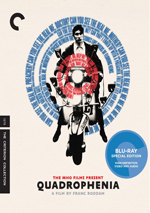 The Blu-ray boasts excellent picture quality along with solid audio and a fairly interesting roster of bonus materials. Although I like this release, the movie itself is a forgettable misfire.